Special introductory price in December! Give us a try, you won t regret it! You ll love staying in this comfortable semi-detached home on a quiet street in the Byward Market. Ideally located for your Ottawa vacation, this home offers 2 bedrooms, a spa-like bathroom, fully equipped kitchen, washer/dryer, wi-fi and a free outdoor parking spot. Most of Ottawa s major tourist attractions are within easy walking distance. The whole house is available for your private enjoyment. The main floor consists of 2 leisure spaces, a full size dining space and a fully equipped kitchen. There is a private patio area at the rear of the house that can be enjoyed in spring, summer and fall. Free (exterior) parking is immediately behind the house. On the second floor there are 2 full bedrooms, a full bathroom and a laundry room with washer and dryer which guests may use. The Byward market is ideally located for an Ottawa vacation. If you are fairly mobile you may prefer to leave the car at home and explore the many nearby tourist attractions on foot. Parliament, the Mint, the National Art Gallery, the Museum of History, the Rideau Canal and the National Art Centre are all within easy walking distance. If you re visiting your kids, Ottawa U is very close by and Carlton is a short drive away. If you are in Ottawa for work, you can walk downtown in half an hour and the U.S. and many other embassies are a short walk away. If you like to eat in, and/or to shop - it is all within 10 minutes away - you can fulfill all of your shopping needs within the market itself - fresh produce, fish, cheese, the butcher and bakeries are all close by. This area of the city is also home to many great restaurants and cafes and retail of all types abounds (from independent retailers to department stores such as Simons and Nordstrom’s). We provide some laundry supplies, basic toiletries for the bathroom and basic condiments for the kitchen. You are welcome to help yourself during your stay. This is a century home that can comfortably accommodate 4 - or 2 adults and 3 children (we’re a family of 5 and are happy to be able to offer an economical option enabling similarly sized families to stay in one place, all together). If you are travelling with children or the elderly, please note that the staircase is a bit steep and the railing at the top of the stairs is low compared to modern standards. Please be careful! I'm a huge fan of both travel and interior design. It seems natural to combine the two and open the doors of my Ottawa home to the like-minded! Although I've travelled a lot and lived abroad in Japan, India and Philippines, I consider Ottawa home and think Canada is absolutely one of the most beautiful countries in the world (but maybe second to Iceland!). I hope you enjoy Ottawa as much as I do. Enjoy your stay! When I first moved to Ottawa from Toronto (and Vancouver before that) I fell in love with the Byward Market area. I love that the neighbourhood is so centrally located, that you can live without a car and that you can shop for groceries on a daily basis since you're likely to walk through the market every day. When I walked into this house for the first time it just felt right, felt like home, felt warm. Its a piece of Ottawa history, located on a quiet street on the edge of an area of the city that is full of restaurants, cafes, pubs and nightclubs. The area is completely safe but not yet overly gentrified. I think its perfect! Ottawa is a "big enough" city and this house is ideally situated. There is no shortage of things to do nearby, the Byward Market is interesting and full of activity year round and although centrally located, it is SO easy to enjoy Canada's great outdoors from the house as well. The Rideau canal is very close by and a short trip over the bridge takes you to Gatineau park where you can hike, swim, mountain bike, downhill or cross country ski. Located very close to the National Art Gallery, the Mint, Parliament, the National Arts Centre. Olive oil, white and red vinegar, sugar, salt, pepper, hot sauce, ketchup and mustard provided. Well-kept row house in a quiet area near the Byward Market. Very convenient. 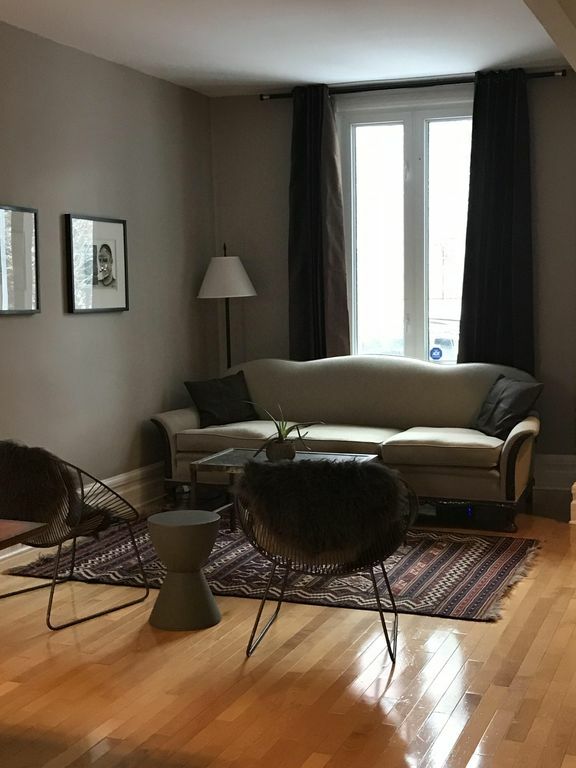 Very convenient location in a quiet neighbourhood close to the National Gallery and the Byward Market. The property was very clean when we arrived. The bed was very comfortable and the kitchen was well-equipped. The place felt quite spacious. Paige was prompt and helpful when I had inquiries. I will definitely come back and I have already recommended this place to my friends for when they travel to Ottawa.